As a quote on a front page of John Daly’s book notes, “There are old pilots, and there are bold pilots, but there are very few old, bold pilots.” This is a truism passed on from flight instructors to their pupils to caution them against irresponsible behavior. But the pilots flying missions during World War II and the Korean and Vietnam wars could not afford to take this folk wisdom into account; they were forced to take risks daily, sometimes hourly, and those who lived to tell about it brought home some incredible stories. 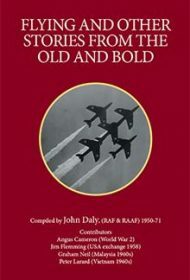 Daly has collected several in Flying and Other Stories from the Old and Bold. It’s a short collection, but full of detail and adventure. There are oddball stories as well: One pilot relates how, after landing and missing his transport back to the mess hall, he jokingly held a thumb out as if to hitchhike when a chopper passed overhead. The pilot dropped a line down to him, which he fastened to his flight suit, only to have them fly in such manner as to whirl him around in giant circles as a joke. Readers who aren’t interested in planes and the minutiae of military structure may struggle with the dense clusters of information on platoons and ranks and particular types of planes and what makes them special. But Flying and Other Stories from the Old and Bold is consistently entertaining and captures the voices of veterans with authenticity and style.